A memorable and characterful story-led post-apocalyptic shooter that spans an irradiated Russia. It's a superbly made shooter that may be a throwback, but is satisfyingly playable and even thought-provoking at times. The Metro games - of which Exodus is the third, after 2033 and Last Light - have always stood out in an often identikit crop of modern first-person shooters. That's partly thanks to their distinctively Eastern European nature - developer 4A Games is based in Ukraine, although it established a new office in Malta when Russia annexed the Crimea. But these games also placed more of a premium on storyline than the vast majority of their peers, thanks to being inspired by the series of Metro books written by Russian author Dmitry Glukhovsky. And they have tended to laugh in the face of modern gaming industry trends. Metro Exodus, fans of the franchise will be glad to hear, preserves those virtues. As far as ignoring modern gaming trends is concerned, it's unashamedly single-player-only and even contains several single-path sequences - although there are also two large open-world hub areas, in which you can potter around taking on side-missions and exploring, and you can pick alternate routes through the areas which steer you to specific destinations, so it doesn't feel unduly restrictive. Metro Exodus's storyline launches it into completely new territory for the franchise though. 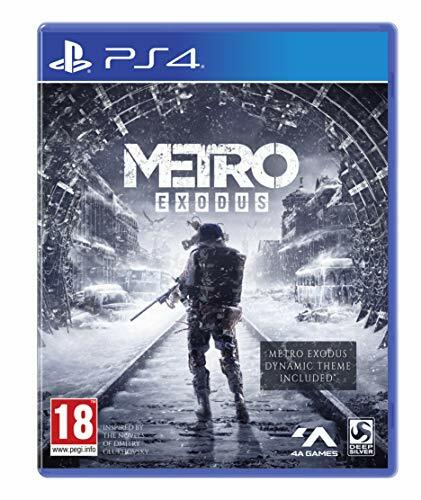 It starts off in familiar fashion, with you controlling series protagonist Artyom, who has emerged from the Metro with a radio, fruitlessly seeking evidence of life beyond Moscow. But when he persuades his wife Anna to accompany him on a similar mission, they are astonished to see a train steaming out of Moscow. A furious story-exposition ensues - which contains some glaring plot-holes, we might add - but soon, Artyom and the rest of his elite soldier crew, the Order of Spartans (including Anna's dad, Colonel Miller), find themselves on a steam train of their own, with a vague plan to chug across Russia until they find a radiation-free area in which to settle. Naturally, things rarely go to plan and countless obstacles are thrown into the gang's path. Metro Exodus's storyline is the sort of epic quest which will be familiar to role-playing game (RPG) fans. It's cleverly paced: 4A Games has had the courage to insert sequences in which Artyom and his merry band bond on their train, and at other times you encounter characters with whom you sit down, drink, smoke and simply chew the fat - and are rewarded if you get through the entire conversation. Metro Exodus's story, with its intense bursts mixed up with more contemplative periods, is mirrored by the gameplay. While there are periods of conventional first-person shooting, there are also stealth sequences and others which are pure survival-horror. In one of those, for example, you must dispatch a horde of mutants while short on not just ammo but filters for your gas-mask. It's particularly agonising if you end up choking to death. You also find puzzle sequences, which generally involve using your common sense to work out how to power-up devices in order to progress. Some of those also have a survival-horror feel, since they throw enemies at you (often mutated wildlife, which abounds and is gloriously weird) while you're trying to work out what to do. As far as Metro Exodus's shooting is concerned, it will please those who found that aspect of the previous two games a bit clunky. There's still a makeshift quality to the weaponry, but this time around there's a fabulous weapon-customisation engine which can be operated on the fly (Artyom can craft certain things using his backpack, but crafting ammo and explosive throwables requires one of the many workbenches in the game). Every enemy weapon you find can be scavenged for parts, so you swiftly build up a selection of different stocks, barrels sights, mechanisms and the like - and you can upgrade weapons to entirely new classes, making the likes of an assault rifle that causes shotgun-like damage, or a shotgun which has a huge magazine. The third weapon you're able to carry is an unpowered one - at one point, you're forced to use a crossbow which, luckily, is a joy to wield. The general feel of the weaponry is much more forgiving and mainstream than in previous Metro games, which should be applauded, and the weapon system is so good that you feel happy to explore them all - a useful tactic if one form of ammo seems to be prevalent at any given point. Another criticism of previous Metro games has been addressed to good effect: the enemy artificial intelligence (AI) is much more convincing. Bandits will take cover and flank you, while unarmed mutants will swarm you in different ways according to their type. 4A Games has let its imagination tun riot while imagining the sorts of mutants that would emerge after 20 years of irradiation: you come across giant, armoured prawns, and so-called Demons which are huge birds that will take you back to their nest if you're unwary. The developer may have gone a bit too far when it decided to populate the last section of the game with huge mutant apes, though. There are animal bosses, too, which are basically bullet-sponges with huge melee attacks; the armoured human bosses are also bullet-sponges, so you wouldn't put Metro Exodus's boss-battles down as one of its strengths. The map can annoy, too: it's deliberately basic but in the larger open-world areas, it can be positively misleading. Another slightly questionable element of Metro Exodus is its replayability. It's a pretty meaty game, which will take you a good 20 hours to complete, but its single-player-only nature doesn't instantly encourage you to return to it and, unlike Metro: Last Light, it only has one ending. But at least you can replay specific chapters, returning to complete any side missions or exploration objectives you missed in the open-world areas. That lack of overt replayability is a shame, since Metro Exodus's game-world is a fine place in which to be. It's packed with character and originality and, particularly in its later stages, proves surprisingly thought-provoking. You can tell that 4A Games - inspired by Dmitry Glukhovsky's books - has had fun exploring post-apocalyptic themes, like what humans would get up to if the rule of law broke down, and outsiders holding out against invaders. Then there's Artyom himself, who doesn't really speak throughout the game, but is the human equivalent of a cockroach - able to survive fortune's most outrageous slings and arrows - and is so determined to find his own personal Eden that, ironically, he's prepared to die in the process. Post-apocalyptic games may have been done to death, but Metro Exodus still manages to generate a new spin on the genre, due at least in part to its uniquely Eastern European worldview. It's a fine game too: beautifully crafted, intelligently placed, rich in terms of story and endowed with gameplay that is both satisfyingly varied and nicely fettled. Sure, it doesn't break much new ground (although its weapon-customisation system will surely be copied), and there are those who will argue that, format-wise, it's a throwback. But if you like your shooters to tell the sort of story you would enjoy in a movie, and to ooze distinctive personality, you should find it very satisfying. If you're looking for a multi-player romp, however, then you'll need to look elsewhere - but we applaud the game for that sense of confidence.